If we were to believe the rhetoric of some in Washington and various pro-regulatory groups like Free Press, you’d think we still lived in the 1800s and that a handful of newspaper barons like William Randolph Hearst and Joseph Pulitzer still dominated our media landscape. Just today, in fact, Sen. Byron Dorgan (D-ND) introduced a “Resolution of Disapproval”–largely at the urging of Free Press and other regulatory advocates like Parents Television Council–that would overturn a half-hearted media liberalization effort undertaken by the Federal Communications Commission last December. That FCC effort dealt with just one of the myriad regulations governing media structures in this country: the newspaper/broadcast cross-ownership rule. The newspaper/broadcast cross-ownership rule, which has been in effect since 1975, prohibits a newspaper owner from owning a radio or television station in the same media market. “No changes to the other media-ownership rules [are] currently under review,” FCC Chairman Martin noted at the time, leaving many TV and radio broadcasters wondering when they will ever get regulatory relief. In a New York Times op-ed released at the same time as his December proposal, Martin argued that “in many towns and cities, the newspaper is an endangered species,” and that “if we don’t act to improve the health of the newspaper industry, we will see newspapers wither and die.” Moreover, he wrote, “The ban on newspapers owning a broadcast station in their local markets may end up hurting the quality of news and the commitment of news organizations to their local communities.” In other words, newspapers need the flexibility to change business arrangements and ally with others to survive. Chairman Martin is right, and those are just a few of the arguments for scrapping a regulation that dates to a bygone era. But Martin’s FCC isn’t proposing anything so far-reaching as complete deregulation. Instead, he would loosen the rule only in the nation’s 20 largest media markets—and only for newspapers, not other struggling sectors like broadcast radio. Despite that fact, Sen. Dorgan and his FreePress comrades decry the proposal using the sort of doublespeak rhetoric that has become all too common in media policy debates. In a press releases today, for example, FreePress urged their members to petition Congress to stop this “massive giveaway” by the FCC. Only an organization so in love with Big Government as Free Press could characterize the slight relaxation of an archaic FCC regulation as a “giveaway.” How, after all, can the partial removal of the red tape that smothers a dying sector be considered a “giveaway”!! 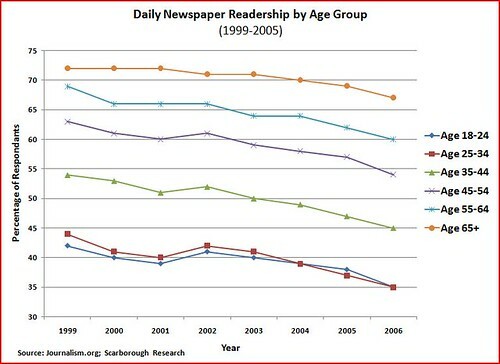 The gradual loss of readers has taken a toll in terms of lost advertiser revenues and stock values. 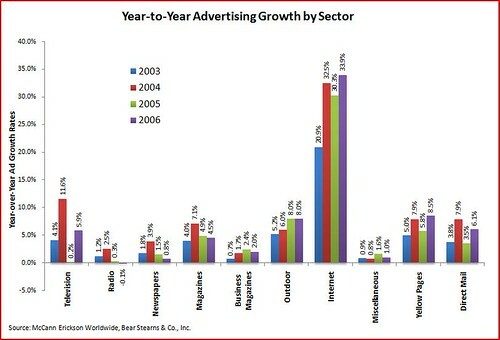 Exhibits 3 and 4 shows the sector’s plummeting advertising dollars relative to other media. 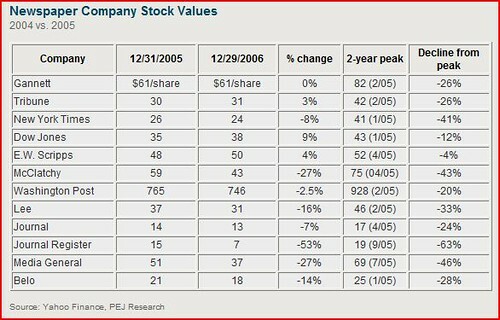 And Exhibits 5 and 6 gives you a feel for how stock value has been decimated in recent years, with almost all newspaper stocks losing significant value. 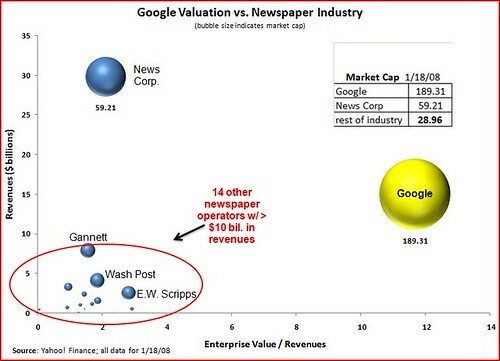 Can newspaper survive in this environment? I think many will because they have finally come to accept the realities of the Information Age and altered their business models to respond to new competitive pressures. Others, however, will struggle as they continue to bleed readers and advertisers. Remember, a newspaper costs a lot more than the couple of quarters we pay for it. Advertising is the only thing currently cross-subsidizing all that wonderful content we get in each edition. 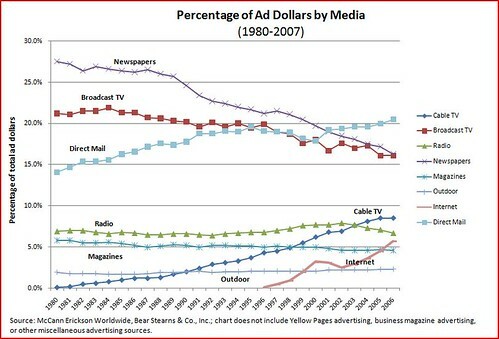 And those advertisers now have many other places to put their ad dollars in a multi-media world characterized by information and entertainment abundance. Why then would Sen. Dorgan and FreePress want to leave in place decades-old regulatory shackles that might hinder the ability of this struggling sector to respond to their many unregulated media challengers? 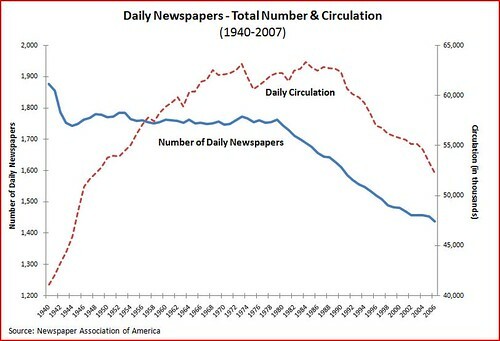 Either those critics are stuck in the past and believe that papers somehow continue to dominate society’s information cycle, or else they would rather just see papers wither and die because they worship at the alter of atomistic media mandates. That is, they have a sadistic desire to see papers fail and not allow any serious owners step in save them simply because they believe in some mythical “Mom & Pop” media world where Joe Blow or Jane Doe should own the local papers. In their view of things, anyone who is either (a) wealthy or (b) an owner of multiple outlets is basically evil and hell-bent on dictating the thoughts of the masses from above. It’s what I have called the “neo-conspiratorial puppet-master theory of media manipulation” that seems to enslave the minds of many people like Sen. Dorgan and Free Press today. It’s all poppycock, of course. But, amazingly, their colorful rhetoric and creative conspiracy theories now dominate thinking about media policy in the United States. When newspapers start dropping like flies, you know who to blame.